An original letter of correspondence between Joshua Coffin Chase and sales agent W. E. Edwards. Topics discussed in the letter include Isleworth packinghouse superintendent Corbett Hutchinson's upcoming business trip to New York City, New York, and Washington, D.C. and Chase's request to have Edwards visit Potomac Yards for inspection. 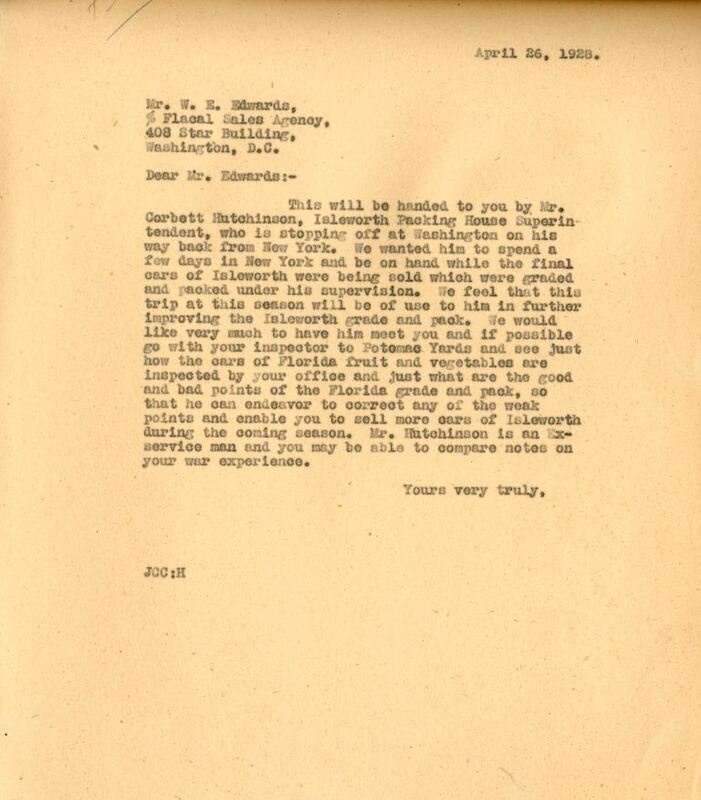 Original letter from Joshua Coffin Chase to W. E. Edwards, April 26, 1928: box 49, folder 20.91, Chase Collection (MS 14), Special and Area Studies Collections, George A. Smathers Libraries, University of Florida, Gainesville, Florida. Digital reproduction of original letter from Joshua Coffin Chase to W. E. Edwards, April 26, 1928. Flacal Sales Agency, Star Building, Washington, D.C. This will be handed to you by Mr. Corbett Hutchinson, Isleworth Packing house Superintendent, who is stopping off at Washington on his way back from New York. We wanted him to spend a few days in New York and be on hand while the final cars of Isleworth were being sold which were graded and packed under his supervision. We feel that this trip at this season will be of use to him in further improving the Isleworth grade and pack. We would like very much to have him meet you and if possible go with your inspector to Potomac Yards and see just how the cars of Florida fruit and vegetables are inspected by your office and just what are the good and bad points of the Florida grade and pack, so that he can endeavor to correct any of the weak points and enable you to sell more cars of Isleworth during the coming season. Mr. Hutchinson is an Ex-service man and you may be able to compare notes on your war experience. Chase, Joshua Coffin. 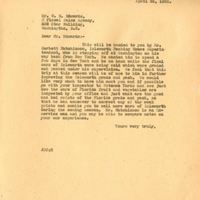 “Letter from Joshua Coffin Chase to W. E. Edwards (April 26, 1928).” RICHES of Central Florida accessed April 21, 2019, https://richesmi.cah.ucf.edu/omeka/items/show/2779.